Jim Ortuno's unofficial motto is, "If it holds still long enough, I can upholster it." And it's not much of an exaggeration. The upholsterer's customers have trucked furniture, hot rods and high-end sports cars hundreds of miles to be retooled in his little shop in Shoreham. Ortuno, 59, has also upholstered dollhouse furniture, motorboats, the cockpit of a small airplane and an antique baby buggy. His trade and craft is about more than just making things look pretty. Ortuno is part structural engineer and part artist, tasked with rebuilding furniture or automobile interiors from the inside out and then, yes, making them look good. His skill has won him fans all over the country, and the waiting time to get an item into his shop routinely runs two or three months. Ortuno, a California native, got his start in upholstery at 16, working in the shop owned by his high school girlfriend's father. "Cars are king in Los Angeles," Ortuno says — and, fittingly, that business focused solely on auto upholstery. The after-school job turned into a summer gig during college, though Ortuno, a criminology student, didn't intend to make upholstery his life's work. When he graduated during a hiring freeze and couldn't find a job, he landed back at the upholstery shop in L.A. Seven years later, after opening a second branch of the business in the San Fernando Valley, Ortuno bought out his mentor. He was officially in business, and over the years his auto upholstery shop became so popular that he was booked as much as a year in advance. Fast-forward a few decades, and Ortuno and his wife were ready for a big change. His wife dreamed of owning a bed-and-breakfast, he says, which is how the family ended up moving across the country to Shoreham, Vt. They purchased the Shoreham Inn, at the time a bare-bones operation, and began updating and refurbishing the 19th-century lodging house. The couple eventually sold the inn, but stayed in the rural Addison County town with which they had fallen in love. 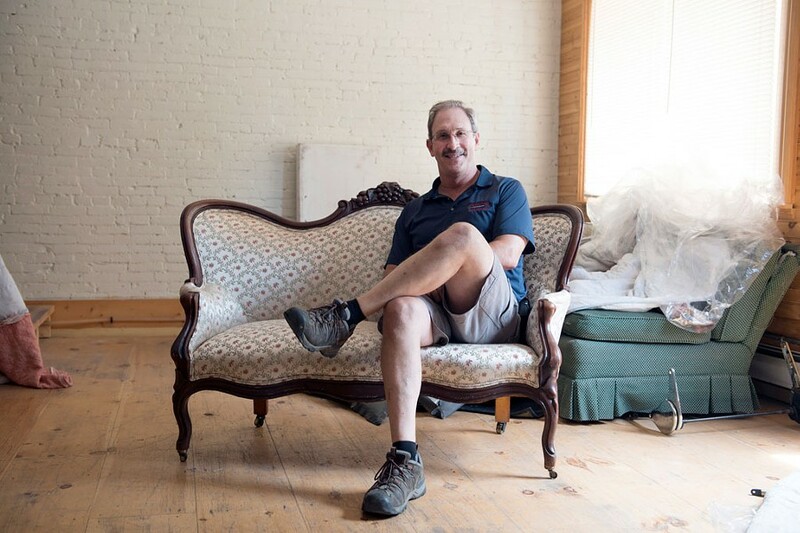 After moving to Vermont, Ortuno set up his upholstery shop across the alley from the inn and branched out from auto work into furniture upholstery — he says the two are like "apples and oranges." "When I moved here, I thought I was going to do tractor seats," Ortuno jokes. He assumed there wouldn't be enough hot rods and sports cars in the hills of Vermont to sustain his business as it once was. Then he stumbled across Restoration and Performance Motorcars, the high-end garage in Vergennes run by father-and-son duo Peter and Steve Markowski. Soon Ortuno was doing all the upholstery for the shop. After his work on a 1959 Ferrari coupe started winning awards at local auto shows, his work docket booked up a year in advance. Ortuno enjoys working on cars in part, he says, because "you get to enjoy someone else's dream." The upholstery is typically the last piece to fall into place in an often-years-long process of refurbishing an old car. "I'm the last guy on the food chain," he says. The body is polished and shined up; the engine purrs. "[The owner] has been waiting years to sit in this car, turn the key and drive it down the road," he adds. On a recent afternoon, Ortuno is at work in his shop reupholstering an old armchair in vintage wool Swiss Army blankets. Close at hand is Eric Raymond, 18, Ortuno's apprentice of just a few weeks. Finding someone to train in his trade is difficult, Ortuno says: "The first thing they need is patience, patience and more patience." Ortuno and Raymond upholster a car seat. Ortuno typically sees a few different categories of furniture move through his shop, among them family heirlooms and antique or flea market finds. Occasionally he'll reupholster a brand-new piece of furniture that someone fell in love with but couldn't get in the desired color or fabric. He also sees pieces that might not technically be worth rebuilding and reupholstering, but customers who are sentimentally attached to them bring them in nonetheless. "The new stuff's all junk," says Ortuno of furniture manufactured today. He advises that yard-sale hounds and furniture shoppers keep an eye out for heavy, hardwood pieces with old springs in the cushions. "If it takes two people to lift a chair up," he says, you've typically stumbled upon a high-quality piece. Customers who bring a piece to be reupholstered may experience sticker shock. Material alone can cost Ortuno more than a cheap sofa from a big-box store. The good news? "Quality will cost less in the long run." The original print version of this article was headlined "Stitch in Time"